Established in 1997, B&C Collection manufactures a wide range of high quality garments from polo shirts and t shirts to soft-shells all designed with your printed or embroidered logo in mind. From Men's, Ladies & Children's styles, B&C T-Shirts offer everything from retail cuts to classic shapes perfect for workwear, events, promotions & more. B&C's Polo Shirt range has been especially designed for printing your logo. With a smooth surface for enhanced printability, shop the range today. B&C's sweatshirts incorporate exclusive fibre technology which guarantees enhanced printability thanks to its unique blend of polyester and cotton. 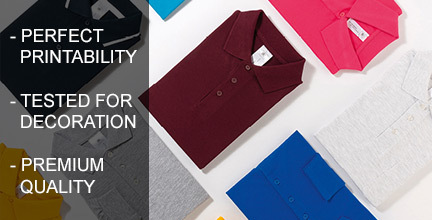 B&C pride themselves on being industry leaders in quality polo shirts. From fabric composition to neck-tape and rib, here B&C explain the more technical details of how to spot a high quality polo shirt. B&C pride themselves on investing time and resource into making their garments as print-friendly for your logo as possible. Using 100% combed cotton for a flatter print surface, you can trust B&C to be the right brand for your design.